4. 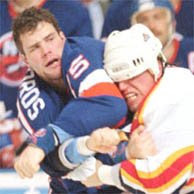 Brett Lindros- Baby Lindros (aren’t they all?) drafted 9th overall in 1994 because he was the younger brother of Eric was supposed to lead the Islanders into the 21st century. Instead, he played a total of 51 NHL games, as the Islanders and a lot of other teams passed on players like Chris Drury, Patrick Elias, Marty Turco, Daniel Alfredsson, and Steve Webb. Yikes. 2. Alexandre Daigle- Another first overall pick, this time from the 1993 Draft ahead of Pronger, Kariya, and the heralded Hal Gill. Daigle signed an enormous contract and coasted through his time in Ottawa. Daigle is quite possibly the biggest bust in NHL history as a first overall pick because of his staggering junior statistics and the number of teams’ management he gave headaches. Daigle was a primadonna in the worst sense of the word and after years of futility finally left the NHL in 2006. 1. Alexei Yashin- If you don’t know why, please ask my esteemed colleague, Mr. NetCrasher. I’m sure he’s got a few things to say about Yashin. I don't think I'll ever get tired of watching that Patrick Stefan lo-light! It's hilarious every time I see that blunder! Alexi Yashin can $%@^# my $#%^# and jump the $%^## off a @#$%. What a $#%@ waste of @#%$ time and money. Anyone with a Yashin jersey should be entitled to a full refund plus pain and suffering.